Planting Seeds of Change ... and Watching Them Grow! Only one out of five people who make a resolution or set a goal will actually reach their goal or create the change they desire. Are you — like all these other people who say they desire some sort of change — spending your time and creative energy focusing on things that hinder or facilitate your creative process? Have you formed habits that support wishing and wanting rather than having and enjoying what you want? Do you really know what it is you want and how to move towards manifesting it, or are you unclear about what you desire and how to go about obtaining it? It takes awareness, time and attention to refocus our energy, learn new habits and create a fertile environment where our dreams can be planted and nurtured so they grow and come into full bloom. By Planting Seeds of Change, rather than simply setting goals or making resolutions, you actively engage in the organic process of change. Like any process, change requires time, attention and energy; while occasionally it occurs over night, that’s a rare occurrence. Usually change happens much like a seed growing into a plant — slowly, over time, with lots of care and attention. A weed will grow without those things, but you don’t want weeds growing haphazardly in your garden of change and taking over the growing fields of your life. You want seeds carefully and deliberately planted that become strong plants bearing fruit — the change you desire. 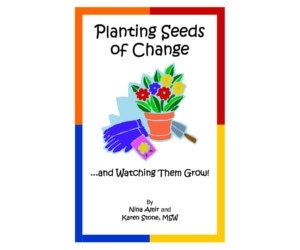 In an easy, four-step process, this booklet teaches you how to pull the weeds that can take over your dream garden and make it hard for the seeds you plant to flourish, how to provide fertile ground for you to plant the seed of change you desire and how to nurture the seedlings into ripe fruit you can experience fully — and enjoy!